This painting shows Montour Falls, NY during the days of the Chemung Canal. Montour Falls was known then as Havana. Havana was a busy canal village, and life centered around the canal. The building in front of the white building, with the cupola, was called the Observatory. Cook also owned the Observatory, which housed his offices until and it burned down in April, 1860. Cook was a tremendous benefactor to his adopted town of Havana. He first arrived in the area to help build the Chemung Canal. He later erected many buildings and founded many businesses in Havana near the canal. 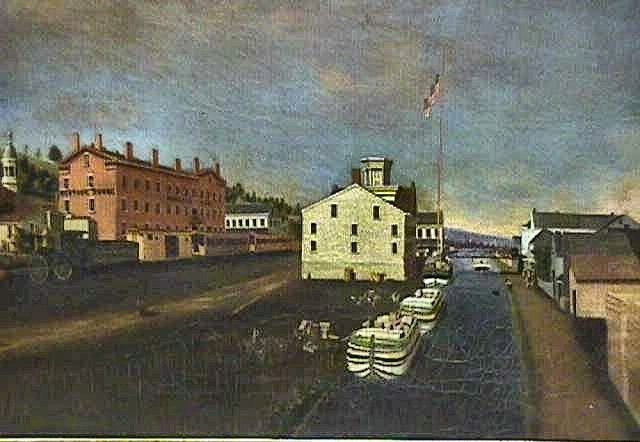 The red brick building in the left of the painting is the Montour House, also built by Charles Cook. The Montour House served as a hotel and as office space. It housed the Bank of Havana and the town newspaper, the Havana Journal. The Montour House still stands in Montour Falls. The canal crossed Main Street where the current Post Office stands in Montour Falls today. This painting can be seen in the Montour Falls Memorial Library (which was built to house the Bank of Havana).